Are you getting ready to throw an amazing Hogwarts-inspired feast? 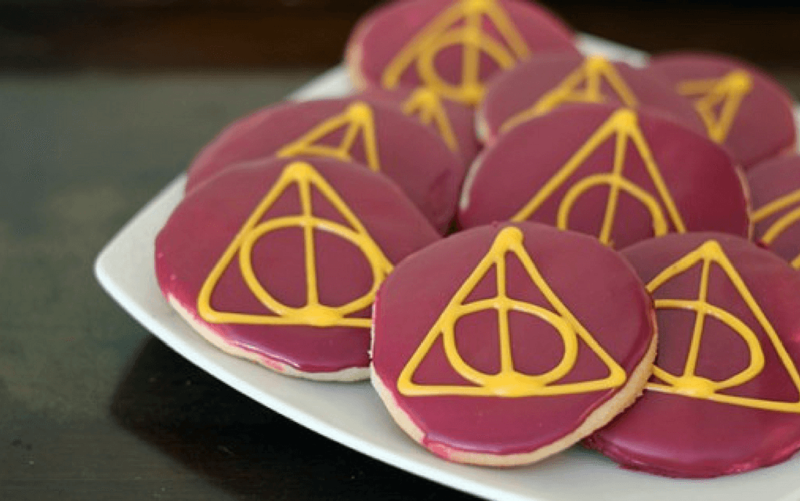 From butter beer and golden snitches to broomsticks and chocolate frogs, take a look at these AMAZING Harry Potter food ideas that will turn an ordinary party into a truly magical event! If you have a Hogwarts fan in the house, you’ll be familiar with some of the magical Harry Potter food the students enjoy at Hogwarts. From butterbeer in Hogsmeade to chocolate frogs on the Hogwarts Express, we’ve rounded up everything you will need for the ultimate Harry Potter party. 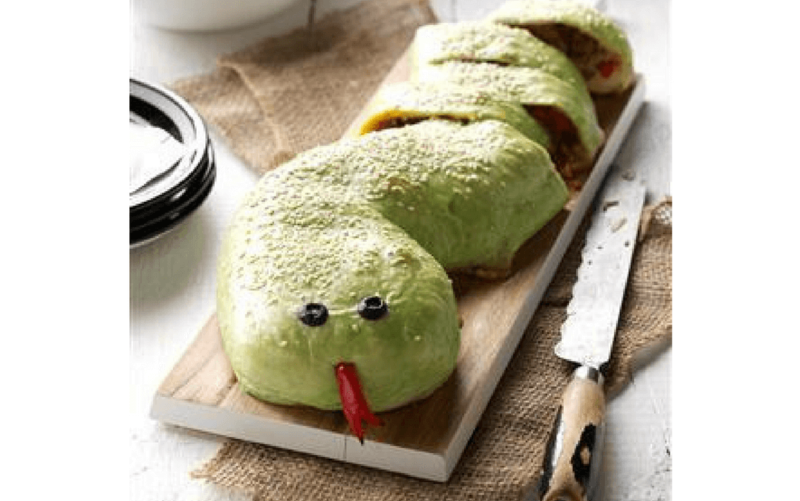 How about this slithering snake roll from Taste of Home which is not only delicious but show-stopping as well! Filled with meat, vegetables and cheese it can be sliced and served to all your party guests to make your party food more of a meal. 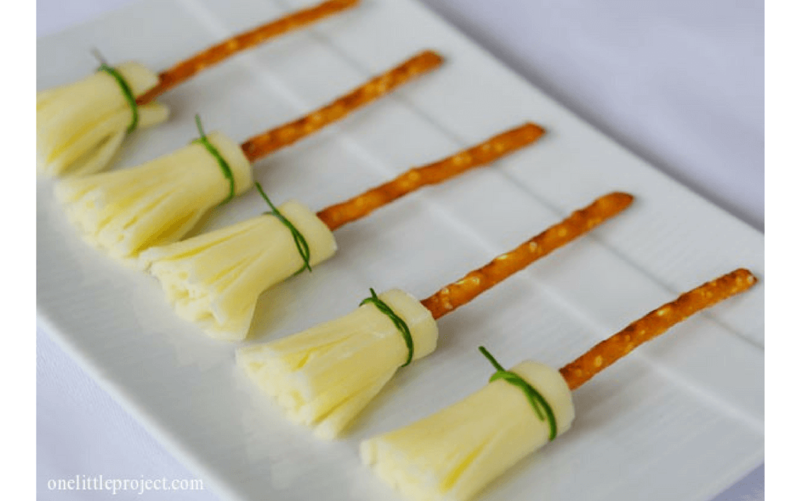 Cheese pretzel broomsticks, like these ones from One Little Project, are creative and cute – and perfect for a Hogwarts-inspired party. 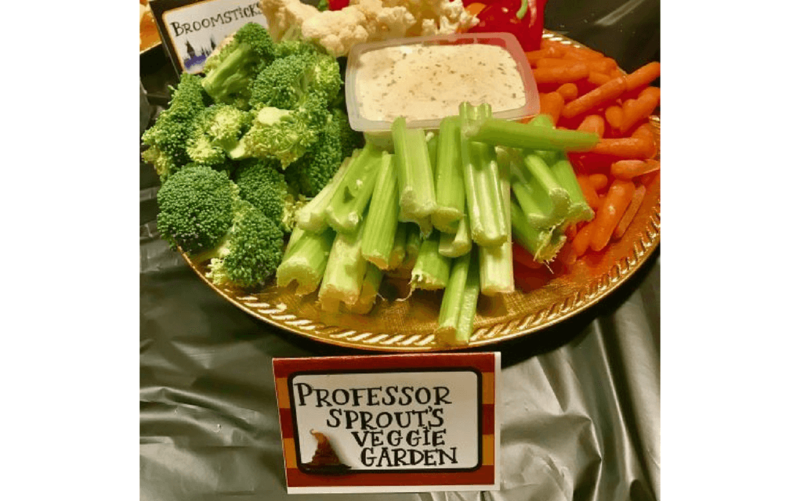 Professor Sprout would be thrilled to join your party….well, maybe just a selection of her veggies! Mom Always Finds Out incorporated a healthy party choice with this tasty veg platter. Sweet Harry Potter treats are easy to come up with, but you’ll want some savoury choices too. 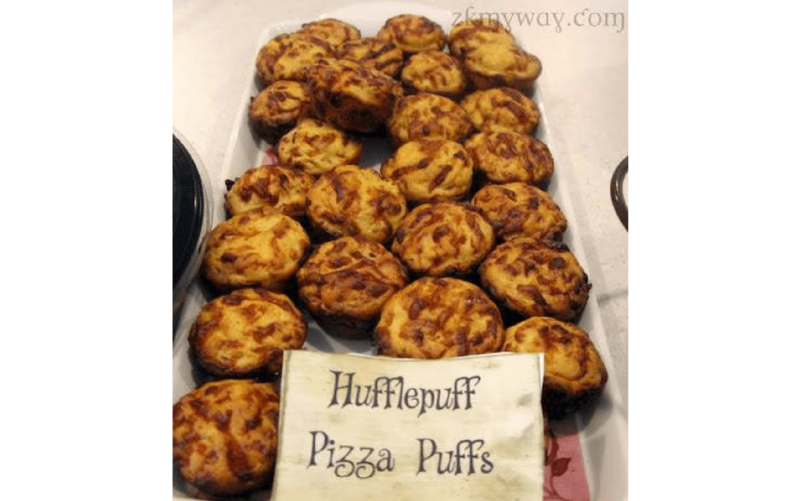 ZKMyWay’s Hufflepuff Pizza Puffs will definitely be a hit – make them up in advance and pop into the oven as the party gets in full swing. 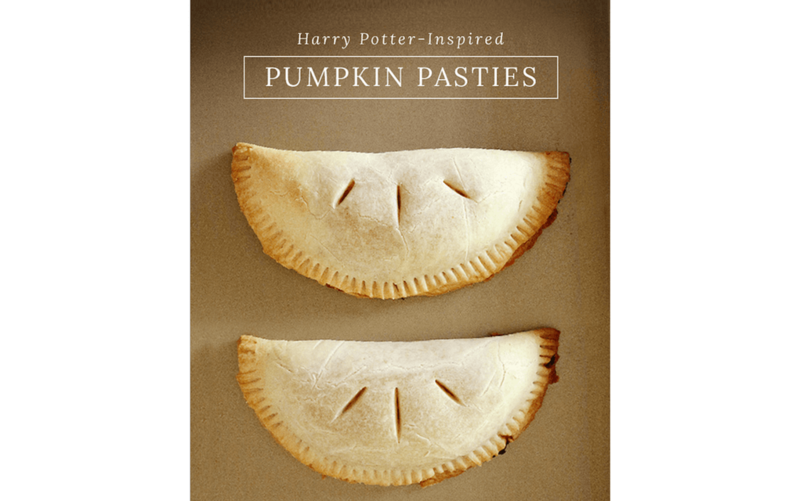 Pumpkin pasties are a fun favourite that the Hogwarts students buy on the Hogwarts Express. These pasties we found on Popsugar are a tasty combination of roasted pumpkin, butter, garlic and cheese – perfect for parties, or even for HP-inspired lunchboxes. 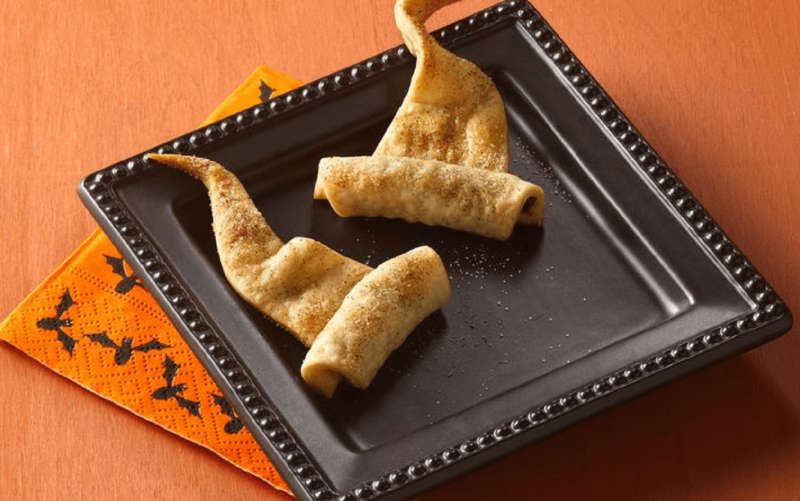 Food & Wine created this delicious recipe, suitable for kids or adults, filled with mascarpone, pumpkin, brown sugar and cinnamon – you’ll actually want to receive one of these Howlers! 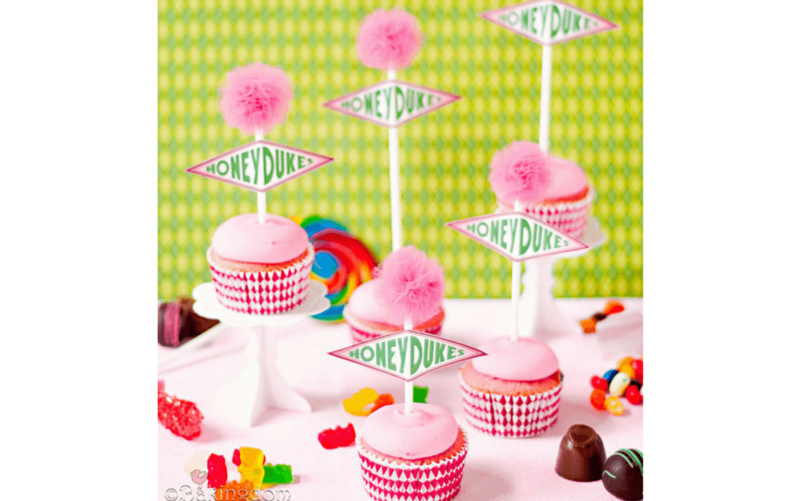 These Honeydukes candyfloss cupcakes from Bakingdom look straight out of the movies! With real candyfloss inside, they are the perfect party treat for both adults and kids. 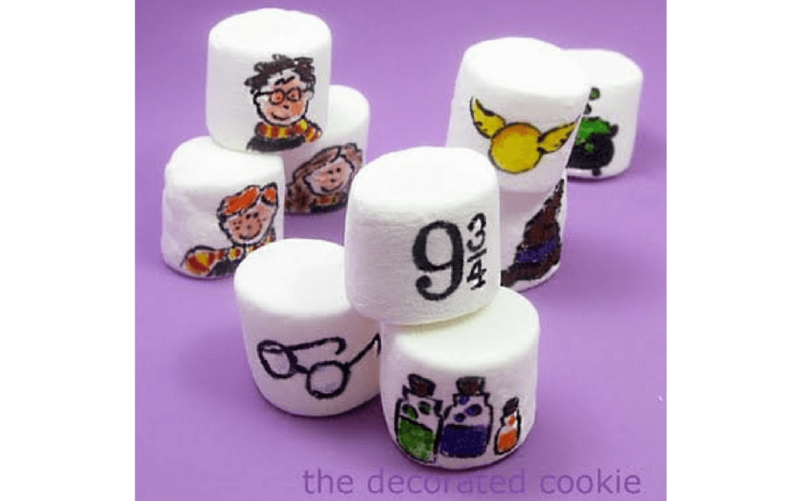 Edible pens and a little creativity are all that’s needed to create some Hogwarts marshmallow treats like these ones from The Decorated Cookie. If you aren’t a confident artist, what about trying some house colour patterns or some handwritten spells? 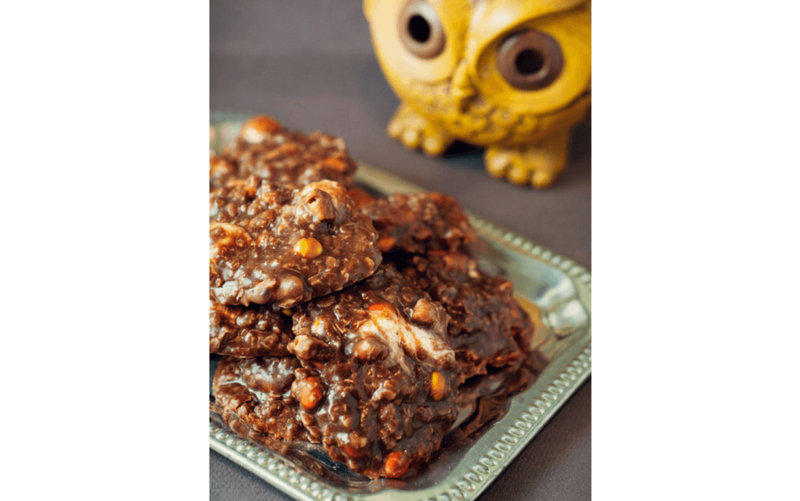 Symbolic and tasty, these Deathly Hollow cookies from The Kitchen Magpie would be great on the party table or wrapped up in party bags to take home. 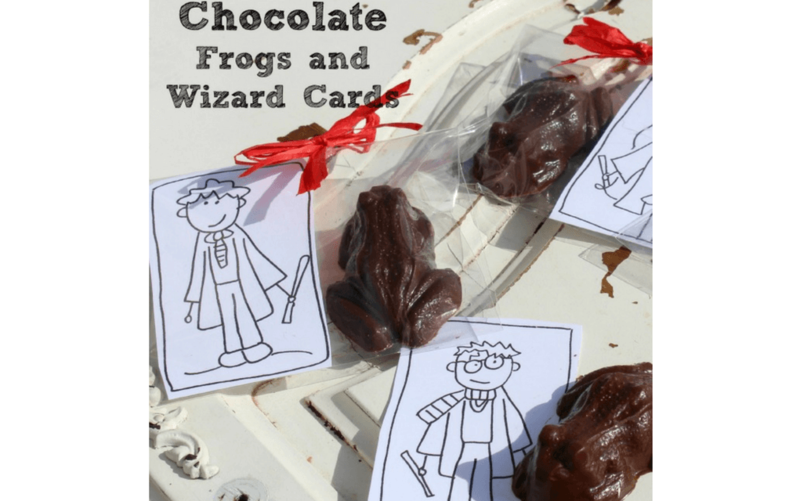 Harry and his friends love the magical chocolate frogs on the Hogwarts Express, and each one came with a famous wizard card. Create your own thanks to Me and My Inklings and pop one into each of your party bags for guests to take home. 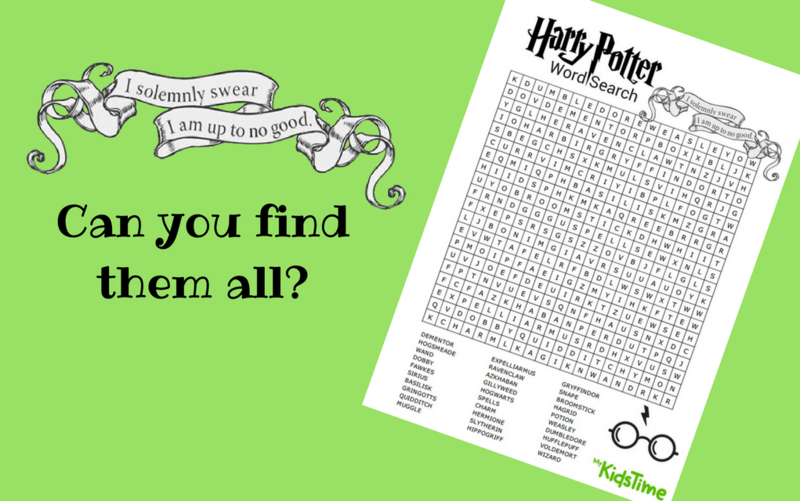 Sign in (or create a free account) to download FREE printables, like this Harry Potter Word Search! 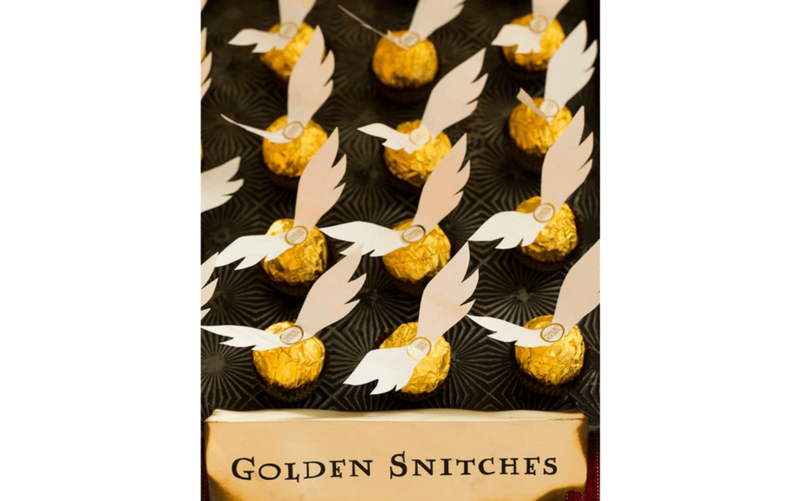 The golden snitch is the ultimate prize, and these ones are no different! 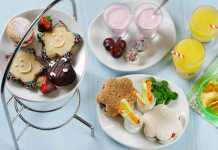 Find out how to make yours thanks to Cooking Classy. 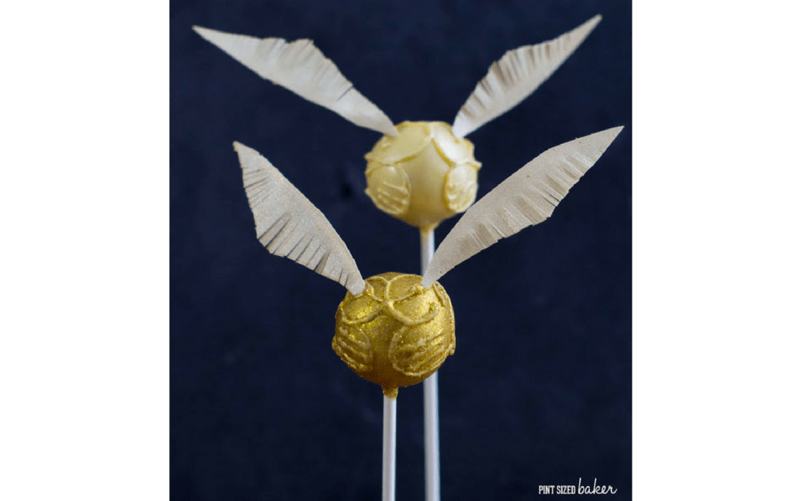 You could also use the coveted Quidditch snitch to create cake pops like these ones from Pint-Sized Baker. 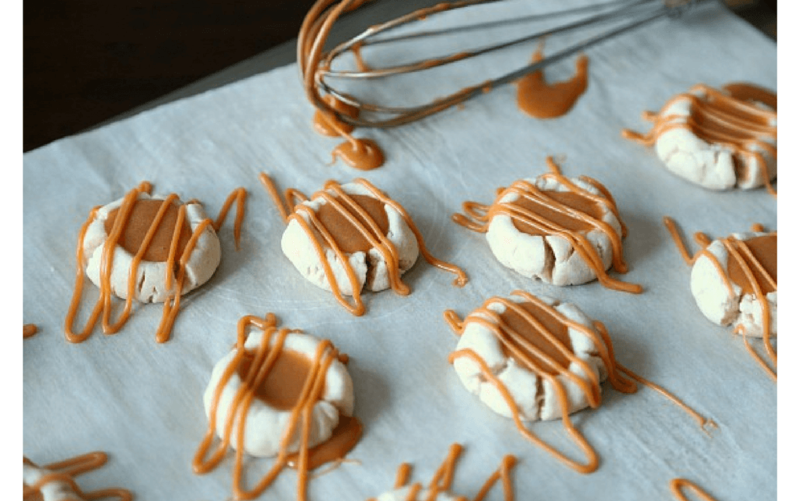 Butterbeer is the students’ favourite treat on their trips to Hogsmeade, and now you can bring the taste of butterbeer to a bite-size cookie with this recipe from Cookies and Cups. Aren’t these amazing? 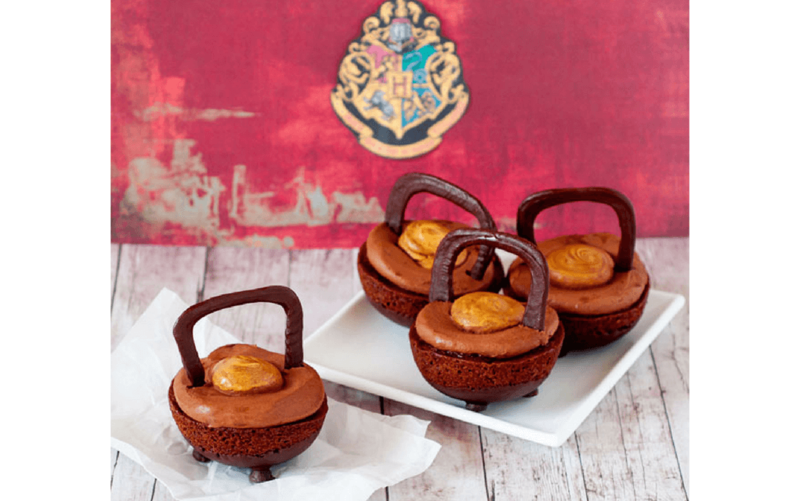 These cauldron cakes from Bakingdom would be the perfect centrepiece for your Harry Potter party food table. Who knew you could create your very own Acid Pops?! 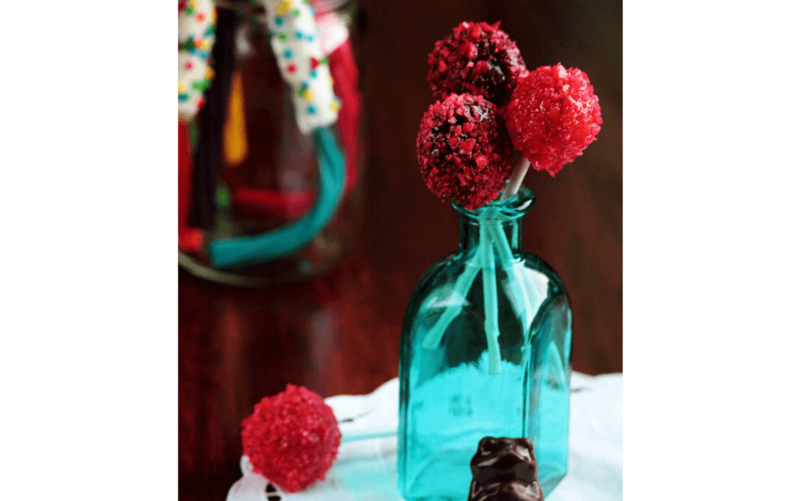 Pastry Affair uses sour lollipops dipped in popping candy to create the effect of the fizzing, whizzing wizard treat! 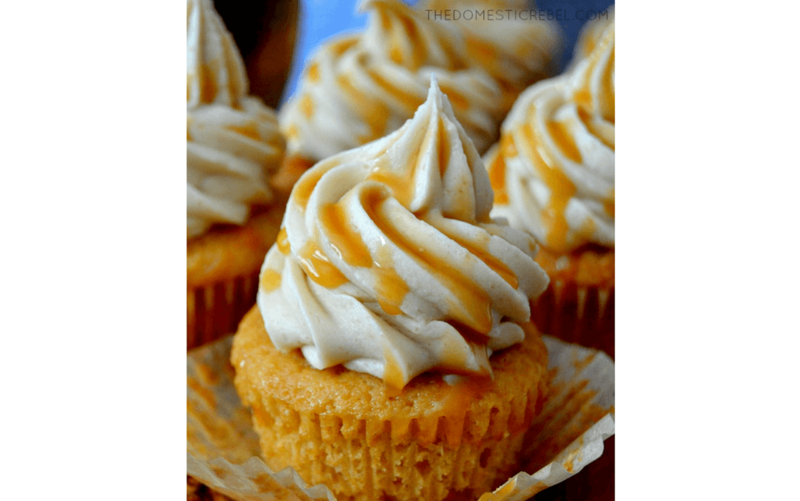 Delicious butterscotch and vanilla flavoured cupcakes, topped with butterscotch and caramel frosting – it has to be butterbeer cupcakes! These ones from The Domestic Rebel look insanely good, and are muggle-approved. 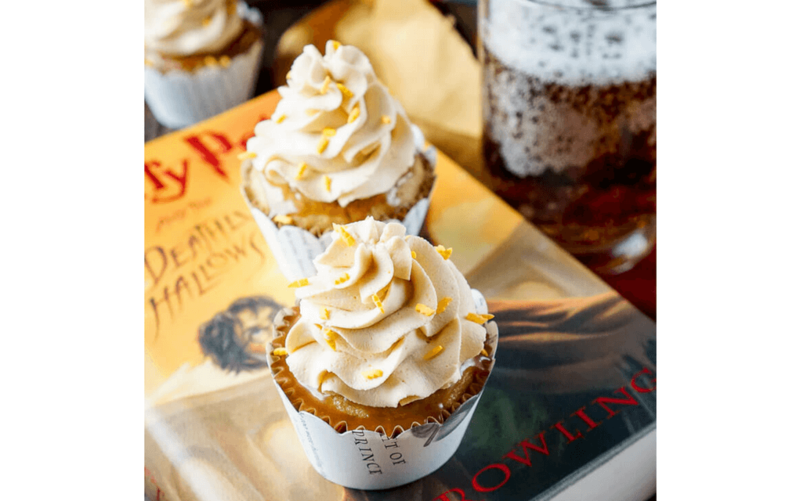 Cast a spell on your tastebuds with more butterbeer cupcakes, this time from Sugar and Soul Co – these ones are light, fluffy and filled with toffee bits! 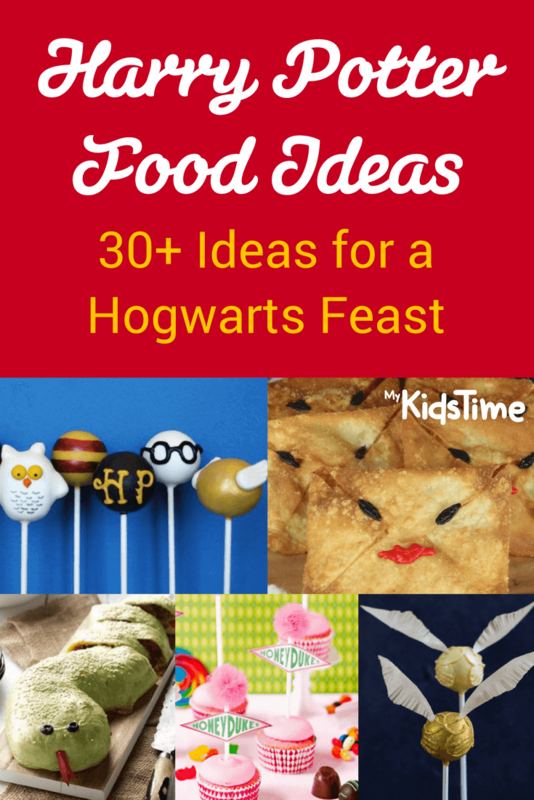 If you’re looking for more ways to incorporate butterbeer (the ultimate of Harry Potter food delights! 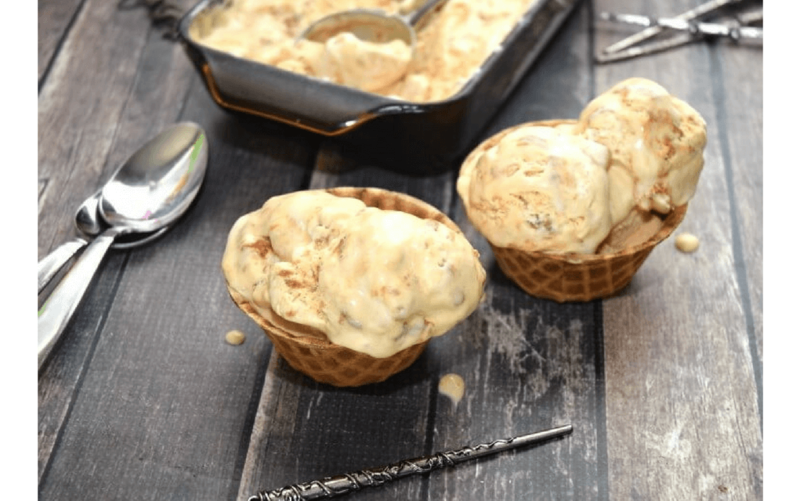 ), what about with this very moreish butterbeer ice cream from The Tiptoe Fairy? The best part is that it’s a no-churn recipe, which means you can make it quickly and easily, and then keep it in the freezer for ice cream emergencies! 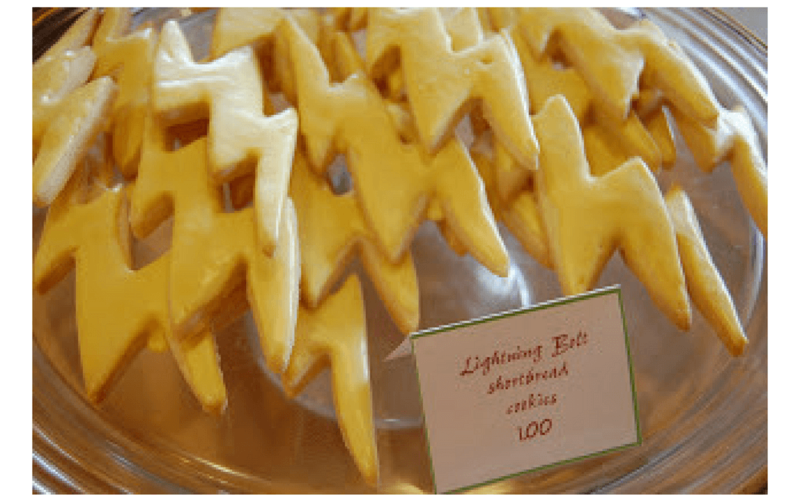 Anything with a lightning bolt fits with the Harry Potter theme, and these lightening shortbread cookies from Cameo Cakes would be a great little Harry Potter snack. 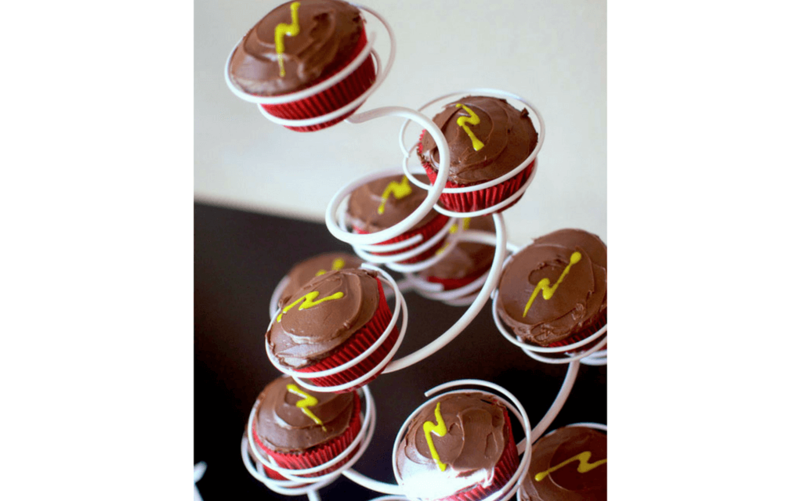 …and so would these really indulgent-looking chocolate lightning cupcakes from Cupcake Diaries. 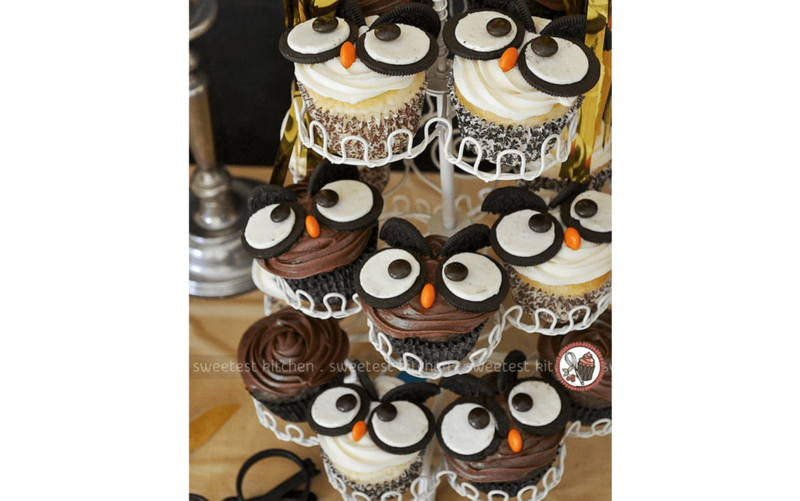 Give a nod to Hedwig with these clever owl cupcakes from Sweetest Kitchen that use Oreos and M&Ms to bring the owl’s features to life. 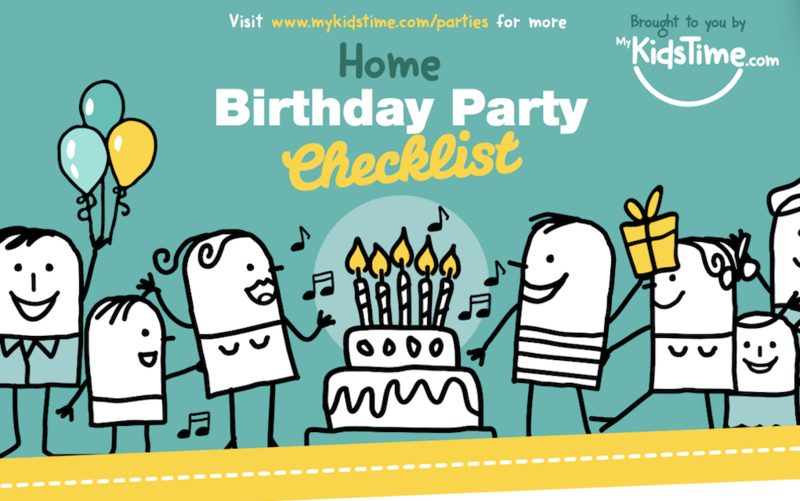 Sign in (or create a free account) to download FREE printables, like this Birthday Party Checklist! The sorting hat scenes were always my favourite, and no Harry Potter party would be complete without some sort of House division. 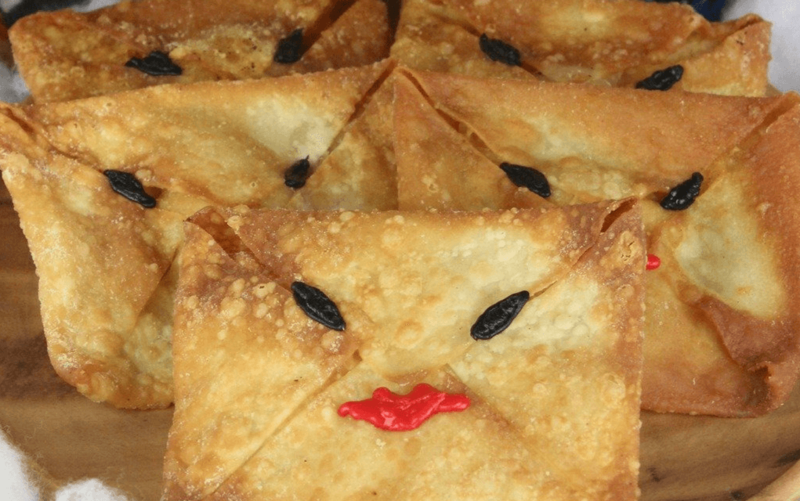 Sugar Bean Bakers came up with a really clever (and delicious!) way to deliver the message. Will your guests be Gryffindors, Ravenclaws, Hufflepuffs or Slytherins? Let the cupcakes decide! 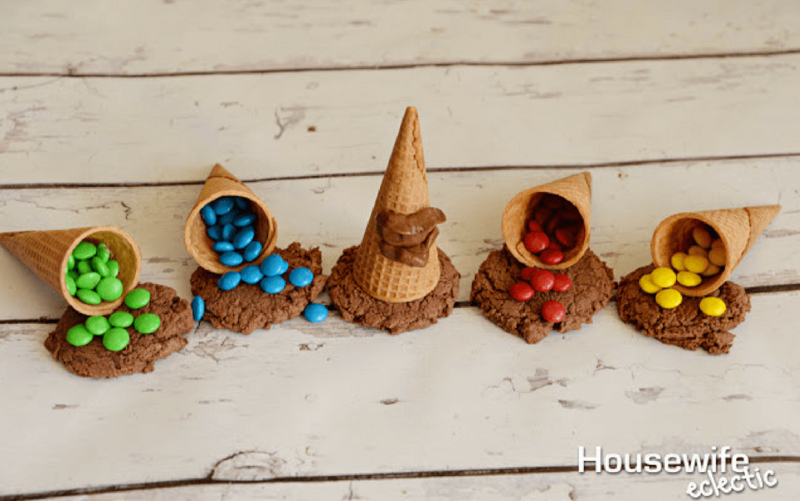 For a quicker, but equally effective, way to sort your guests into their Hogwarts house, try these Sorting Hat cookies from Housewife Eclectic. 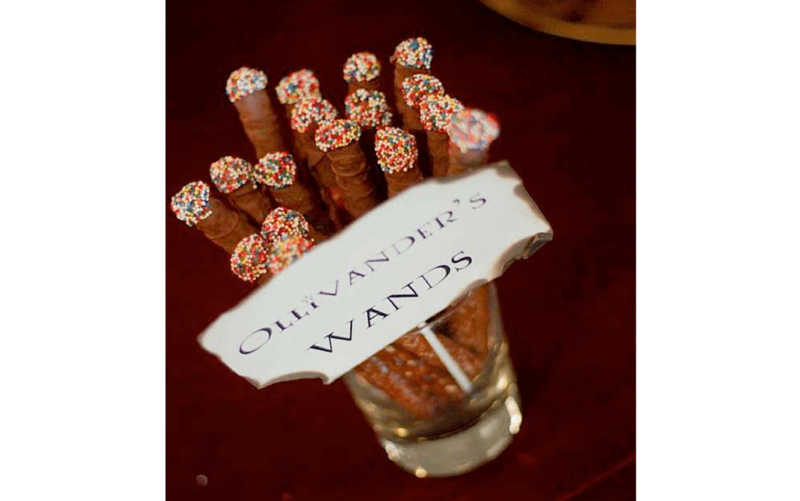 Dip breadsticks or liquorice wands in chocolate and sprinkles, like these ones we found on Kara’s Party Ideas, to make a selection of beautiful (and delicious!) wands that look like they belong in the Ollivander’s shop window. Cockroach Clusters don’t sound appealing, but Bakingdom’s recipe is a guaranteed hit! Marshmallows, chocolate, pretzels, peanut butter, oats and M&Ms….yum! 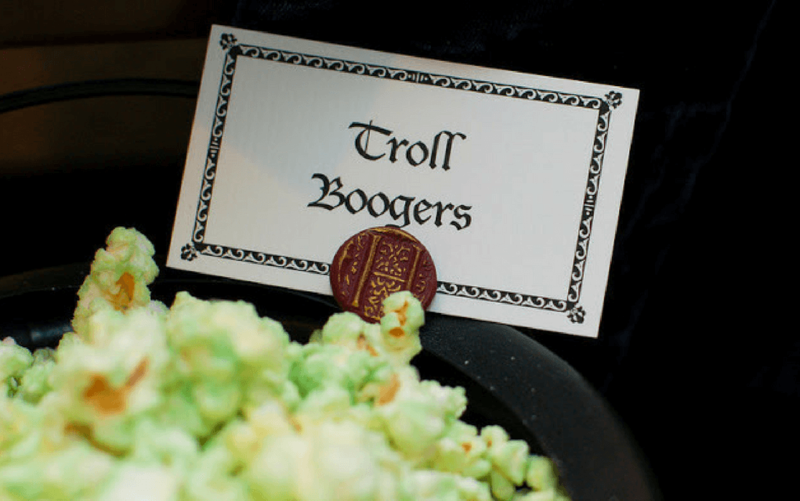 Kids are guaranteed to love these Troll Boogers from Tradewind Tiaras! White chocolate and a little green food colouring are drizzled over popcorn to create this fun party snack. 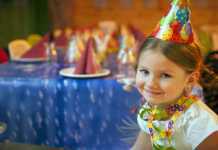 Large glass bowls or jars of sweets and candy are always popular at a kids’ party. 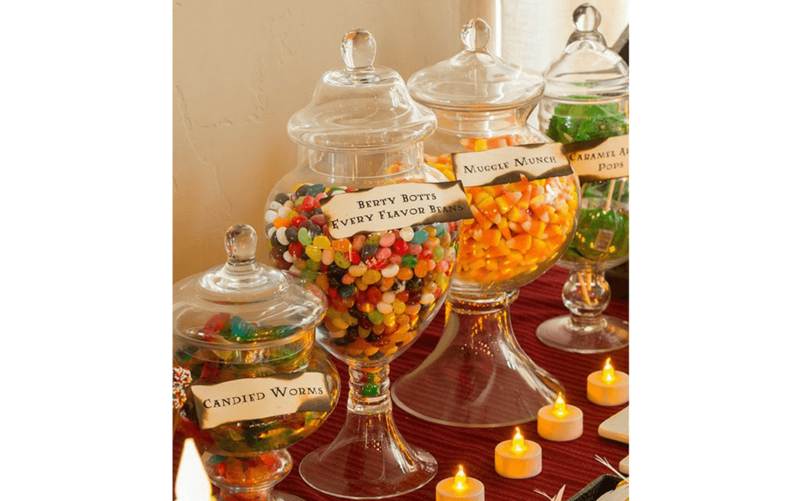 Make some little signs to complete the look, like this table setting from Cooking Classy – jelly beans become Bertie Bott’s Every Flavour Beans, jelly snakes become Candied Worms, and so on. 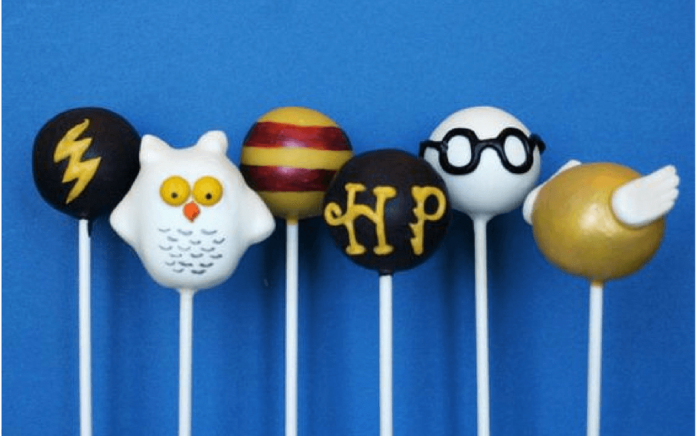 If cake pops are your thing, you will LOVE these Harry Potter-inspired pops from SweetWhimsyShop on Etsy. Amazing! 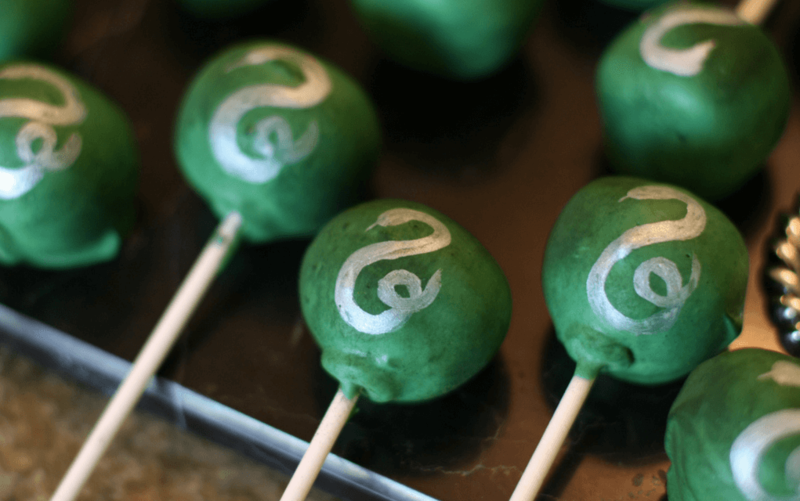 For a Slytherin party, these cake pops from HMH Designs in the Slytherin house colours are sure to be a hit! 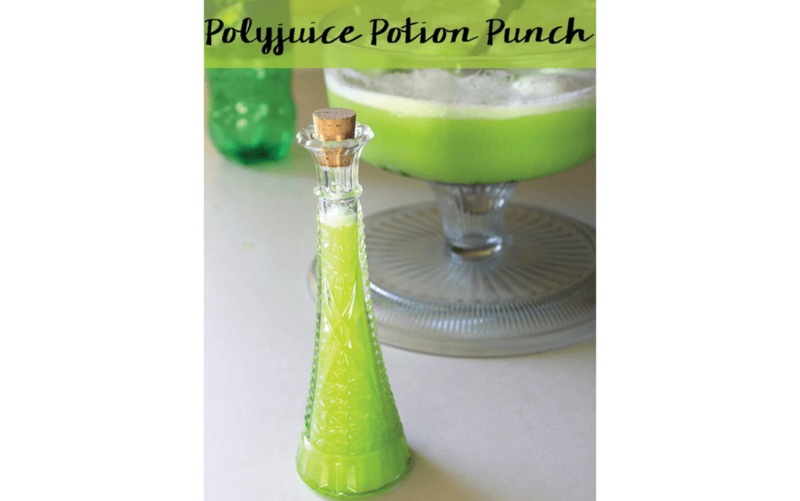 This Grandma is Fun has turned a classic Hogwarts potion into a fun party idea – make your own Polyjuice Potion and wow the guests! A little pastry, some chocolate chips and a sprinkling of cinnamon transforms into Wizard Hats with this incredibly simple recipe from Betty Crocker. 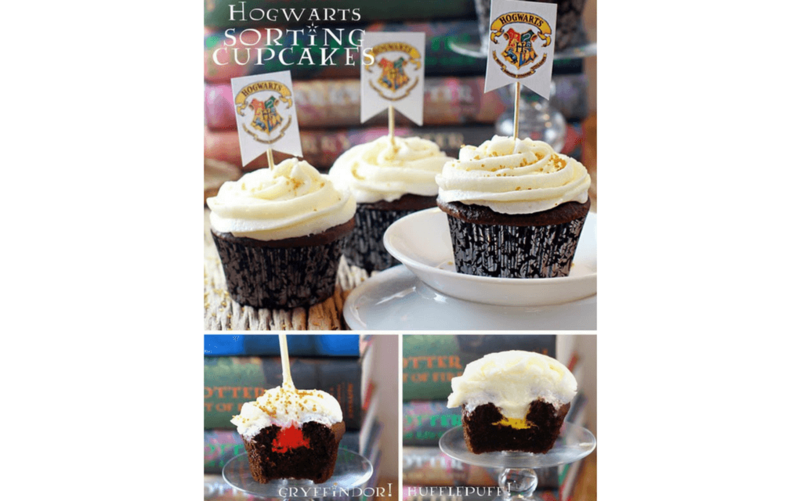 We could eat these Harry Potter food ideas all day long – they’re amazing! Which one is your favourite? Leave a comment below and let us know – we’d love to hear from you!